or inspirational messages to decorate our walls and to lift our spirits when we look at them. a sense of pride in this product and I believe it deserves to be exposed to the public for its wonderful benefits to others. * A calendar that can be personalized using favorite photos with all important dates. * A digital calendar that will automatically display the correct days and dates as each year changes to the new one. * Will automatically transfer and display important annual events like birthdays, anniversaries, and holidays without having to upload manually. * Personal pictures can be uploaded and displayed in the top half of the screen. * The pictures can be changed changed, displayed singularly, or run as a slideshow. * Onetime meetings and appointments, regularly occurring meetings, and alerts can also be programmed so the user will not forget any important engagements. * This has the option of battery power with a plug-in attachment or solar charger to truly make the calendar last forever. * It can be compatible with Microsoft Office to import important dates and appointments from work. displayed singularly or as a running slide show. 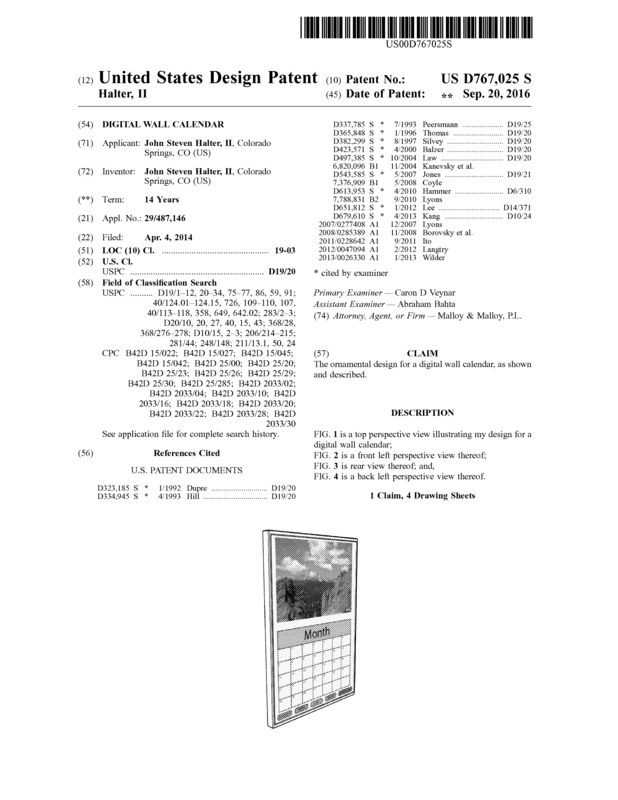 Page created at 2019-04-21 18:15:24, Patent Auction Time.